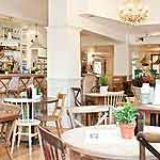 The Hampshire Hog is on the former site of the Ruby Grand and offers a fine selection of drinks and an all-day food menu of British fare. Do you work at The Hampshire Hog? What did you think of The Hampshire Hog? Just terrible. Overpriced, under flavoured and plain rude staff. This place is overrated. I am sorry that you had a problem with the bill. I had the same, I was overcharged and I got a public humiliation from two of the bar staff and the General Manager. Very upsetting as well as celebrating my birthday. Chin up and we are very lucky that we are in London and there are many other bistros to chose from. Celebrating my birthday on Saturday and the music was fantastic - live Jazz by excellent musicians. The food was pretty bad where even a simple bowl of chips was greasy and soggy We also ordered other small starters and these did not get any better, specially the humus with linseed crackers which was bland and a mixture between wall grouting and bird food. Bad texture and no flavour whatsoever......the list could go on but the most disappointing was the waiting staff with the exception of a guy who was very helpful. Overall the staff very arrogant and with the attitude of 'doing you a favour' when serving. The general manager was even worse rude and aggressive when our order was wrong. The decor and the music on that night great otherwise, a waste of time and money. What a disappointment. Having enjoyed the Engineer for many years I was looking forward to this new addition. The setup has far too many covers for the kitchen and the staff to cope with, he food was decidedly mediocre especially when having to wait so long to eat it and the restaurant was extremely loud and noisy. With so many good restaurants in the surrounds I would not go back any time soon. After a previous visit that was a let down due to front-of-house teething problems, I'm happy to report that The Hampshire Hog didn't disappoint on this occasion. The welcome was warm and the place was buzzing. The roasted mushrooms, goats' curd and roasted garlic, bruschetta starter was divine. 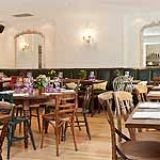 The HH is a welcome addition to the Ravenscourt Park / Hammersmith gastro pub scene. Fabulous brunch here the other day. Great coffee using beans from Caravan on Exmouth Market makes it a real treat. The coffee was up there with some of the best I've had in London since moving from New Zealand 18 months ago. Can't wait to return for dinner. It may have good pedigree, but this pub fails to live up to expectations. Yes, it looks pretty but the acoustics mean it is noisy and conversations can't be heard. We visited for on an admittedly busy Sunday afternoon but service was slow, inaccurate and some of the waiters are a bit too cool for school. Our drinks arrived after our (indentical) main courses and one capuccino had to be sent back because the milk was sour. The eggs benedict would seem pretty easy to do well, but what we were served was pretty mediocre, with a hollandaise that seemed to come out of a packed and buns that were soggy instead of crisply toasted. We only went in because it was raining and we didn't want to treck all the way to the Anglesea Arms. Next time, even if it pours, we won't be popping in. Hammersmith is so lucky to have The Hampshire Hog. What a treat. 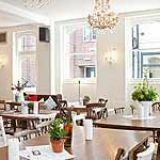 Delicious food, stunning interiors, a garden, the best coffee in West London....what more could a local ask for? I have popped in a few times to The Pantry to grab a coffee on my way to the park with the kids. The staff in there love children which is nice. I have also been after the theatre with a group of mates for a drink. Really close to The Lyric so thats super handy. Gets my vote! Ive been to the Hog three times since it opened last month and absolutely love the place. Fab coffee and breakfast the other morning. Beetroot cured Salmon with pea fritters was like being back in Melbourne. The Osso bucco for dinner was true magic and they have a great wine list. Front of house is not yet flawless but they seem to have a good team who really cares so I'm sure they'll get there. A fittingly grown up version of the Engineer and a superb addition to W6 and West London in general. You must go. 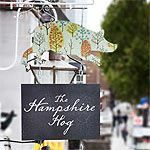 Replacing the Ruby Grand on Hammersmith’s King Street, The Hampshire Hog is a smart food-focused pub brought to you by a lot of the same team who built The Engineer in Primrose Hill into such a favourite with local luvvies and famous faces. There’s already a huge buzz about their new venture, and as most of the team have worked together previously, they’ve hit the ground at a fair old canter. The food and drink scene just keeps getting better in Hammersmith. Recent openings include the arrival of the Ginger Pig butcher and the ale-specialist Duchess of Cambridge, as well as this new venture. Outsiders may consider this part of King Street fairly uninspiring, as it’s not the most pretty part of the borough and you do get the local alkies congregating on the nearby church steps, but it’s great place to live as there are good schools, the Thames and Ravenscourt Park within walking distance and lots of tasty independent restaurants close by. The new owners have done a great job in injecting new life into this venue. Gone are the blackout blinds and dark and moody interior; in come scrubbed pine woods, a gleaming white paint job, posh wallpaper and expensive vintage mirrors. They’ve created a little airy pantry space at the front which focuses on coffee (from Caravan in Exmouth Market) and all-day munching, while the capacious bar area now offers extra covers for food. The actual designated dining area is a fairly compact space to the rear past the visible pass of the kitchen, and the leafy garden out back remains one of the best in the area. It’s not often a new pub is instantly rammed and crackling with life, but The Hampshire Hog is. Practically every seat in the house is taken by local families, couples and twenty and thirtysomething groups of friends. If anything, the sheer buzz of the place may be a little intrusive at peak times in the dining room as the space between tables is slim and you’ll have to listen to your neighbours conversation whether you like it or not. There’s no doubt about it though: this pub brings a different dynamic to an area that’s got lots of good pubs but not many with a buzzy vibe like this one. Open for breakfast, brunch, lunch and dinner, The Hampshire Hog is aiming to be an all-day affair. There’s still one or two teething problems – the dining room is prone to get smoky when the kitchen is working at full pelt and the back doors aren’t opened due to the cold weather, but this is sure to be addressed. Visit in the evening and you’ll find a modern international menu offering very un-pub-like dishes such as sashimi. Other signature dishes have obviously been refined in Primrose Hill and transported to W6. The osso bucco Milanese (£15) is a thing of wonder: the unctuous veal meat falls off the bone and bone marrow at its centre is so good you may want to pick it up with two hands in order to excavate every bit of fatty goodness from its core. It’s probably best not to do this in public. Served on a viscous bed of meaty gremolata gravy, it’s a cold weather smash-hit. Across the table, a roasted piece of cod (£13) with flawless mash, wilted spinach and a parsley sauce also elicits a very positive response. Mains do provide the highlights of the sitting even if a starter of char-grilled butternut squash starter (£6) with chilli, capers, pine nuts and mint is pretty damn good. Slightly less successful is a green papaya salad served cold with medium-rare beef (£6): the beef is a shade too chewy and the salad lacks a bit of extra pep from some chilli. Desserts are more the sort of thing you’ll find at a typical gastro pub – crumble, panna cotta and treacle tart – and cheese comes from Neal’s Yard. Caravan coffee, cocktails using local distillers Sipsmith’s gin, and their own Hampshire Hog bitter: this is one pub with impeccable taste. A face-wincing Sipsmith’s Negroni (£7) is on the aperitif menu and cocktails are definitely are a big deal here, stretching through a range of signature and classic concoctions. 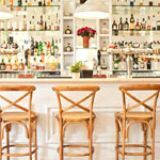 Most cocktails cost around £7 and pints are just shy of the £4 mark – competitive for the area. This little piggy may be new to this part of town, but with its slick new design, excellent food and drink menu and buzzing atmosphere, it’s already right at home. Primrose Hill’s loss is most definitely Hammersmith’s gain.